He began this role in July, 2017, having been associate director of the center during the 2016 - 2017 academic year. Fr. Jamie also is one of the Paulist Fathers' associate vocation directors. Fr. 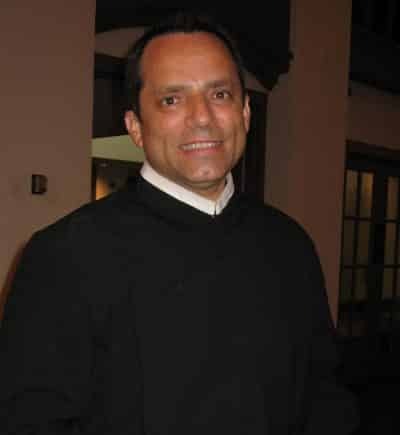 Jamie previously served as associate director of the University Catholic Center at the University of Texas at Austin from 2009 to 2016; associate pastor of the Church of St. Paul the Apostle in New York City from 2007 to 2009; and associate pastor of Immaculate Conception Church in Knoxville, TN, in 2006 and 2007. Fr. Jamie entered the Paulist Fathers novitiate in 2000 and made his first promises on August 4, 2001. While he was a seminarian, he earned a master's degree from The Catholic University of America in Washington, D.C. He was ordained a priest on May 20, 2006. Fr. Jamie grew up on his family's cattle ranch in northern New Mexico. He earned a bachelor's degree at the University of San Diego, majoring in Spanish and International Relations. He also studied at New Mexico State University where he received certifications in Elementary and Secondary Education. Fr. Jamie was a teacher in Las Cruces, NM, Lubbock, TX, and Houston, TX, before entering the Paulist Fathers novitiate at age 35. For more on Fr. Jamie, please visit Facebook, Twitter and Pinterest. To contact him, please call (310) 208-5015, ext. 23, or email him.